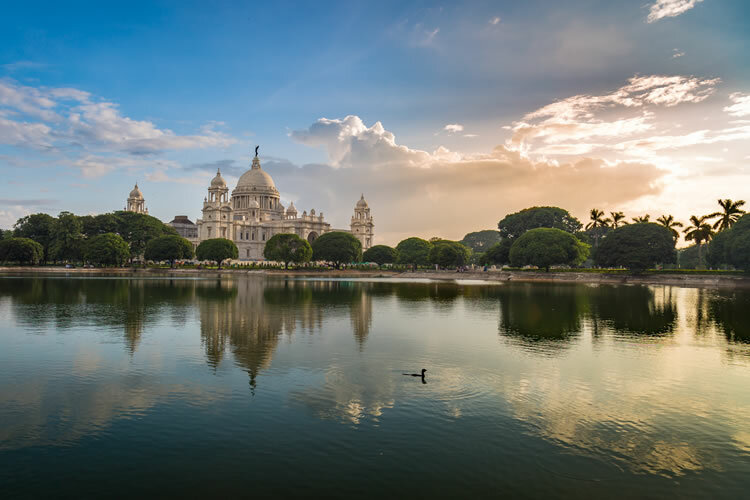 Your adventure starts with a two-night stay in the vibrant city of Kolkata, during which you will enjoy a sightseeing tour that includes visits to St Paul’s Cathedral and Mother Teresa’s House. 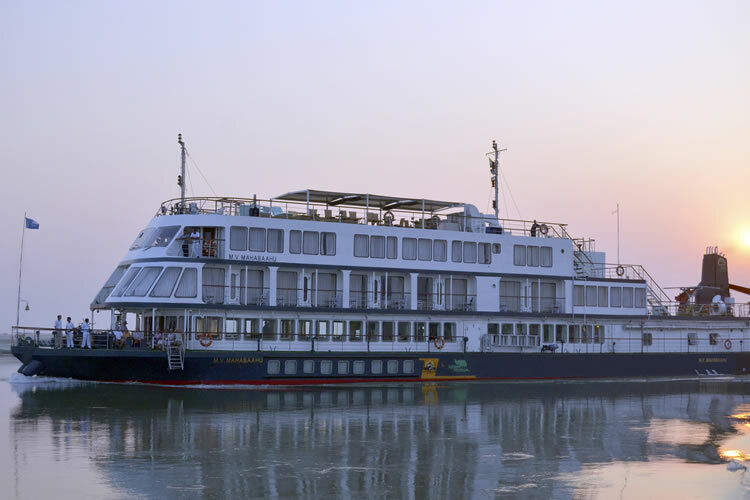 After boarding MV Mahabaahu for your seven-night cruise, you will head downstream towards Jorhat stopping at various points along the river to explore the cultural sights and meet some of the locals. After breakfast, visit the Victoria Memorial (Victoria Memorial is closed every Monday). This marble-white monument is one of the most fascinating landmarks of Kolkata. Here, come face to face with miniature paintings and images of Queen Mary, King George V and Queen Victoria. Of special importance are the Queen's dresses, the famous Rosewood piano, the Whispering Gallery in the dome and numerous artillery weapons used in the Battle of Plassey. In time check out from your hotel and transfer to the airport to board your flight to Jorhat. Arrival Jorhat and transfer to Neamati Ghat (with packed lunch) where you are welcomed on board the MV Mahabaahu. After the essential safety briefing check into your cabin. On the Donyi Polo Deck, we raise a traditional toast to the mighty Brahmaputra River that carves the valley of Assam. If Lucky, you can catch a fleeting glimpse of the Gangetic dolphins and notice the sky flocked with bar headed geese, egrets and cormorants returning to their abodes on deserted islands as the sun lowers itself in the western horizon. After an early breakfast, start your day-excursion to Sibsagar, the ancient city and capital of the Tai-speaking Ahoms who came in the 13thCentury AD to the area from the north-east and were essentially of Tibeto-Burman origin. Visit The Talatal or Kareng Ghar, the palace of the Ahom Kings and the Rang Ghar, an amphitheatre, a place of entertainment or important meetings for the Royals and their guests. Afterwards, drive to a Tea Estate for a relaxed afternoon tea and a traditional Assamese lunch with the estate family who have been involved in the tea business for over a century. As you enjoy your breakfast, sail towards Majuli, a cosmos of Assamese culture where various philosophies co-exist and thrive. After, enjoy a talk on 'Majuli, the seat of Vaishnav culture’ and proceed in the excursion boats to the mainland where a drive takes you to a scenic corner of a ‘Satra’ (monastery) for an interesting cultural performance by Satriya singers and dancers. Enjoy a hot lunch on on board and sail towards the closest Mishing Village. The Mishings live on the bank of river in 'Chang Ghars', houses with raised platforms. All Mishing women are expert weavers. You can buy ethnic colourful cotton weaves and indulges in a dhoti tying and Mekhela Chaadar wearing demonstration. After the Mishing Village visit, MV Mahabaahu heads towards Dhansiri Mukh where the waters of Brahmaputra and Dhansiri meet, while you enjoy a talk on ‘Assam, its geographical location & importance’. Enjoy breakfast and a talk on ‘The River Brahmaputra and the life that exists alongside’.and proceed for the boat safari . The shores are high but you can see roof turtles on protruding drift wood, water lizards, otters, elephants, wild buffaloes, rhinos, darters, herons, pied kingfishers, white throated kingfishers, serpent eagles and many more. The sightings are always determined by the weather conditions. Attend an interesting talk on ‘Kaziranga and the wild life in India’ this morning, before heading to the shores of Bishwanath Ghat. Enjoy a walk through the village, meeting the local weavers, and see how this suburban village thrives. Afterwards, sail on for the next couple of hours and enjoy a relaxed lunch before you arrive in Silghat. Take a short drive to the Kaliabore tea estate, where you will watch the women pick tea leaves and discover the process behind producing Assam Tea. Returning to the ship, stop at a Jute Mill to understand how the Jute fibre is made into eco-friendly gunny bags. Enjoy a cultural evening on the ship, an early dinner and retire for the evening. Overnight onboard. It’s an early start today as you drive out towards the Kaziranga National Park. The park is not only home to the fantastic greater one-horned rhino but as many as 180 more mammals including wild elephants, tiger, deer, buffalo and a rich variety of birds. You will get the opportunity to experience a once-in-a-lifetime elephant-backed safari as you go in search of these animals. After breakfast in Kaziranga, drive on to Bagori, the Western Range of the park, swap the elephants for a jeep and continue your explorations. Later, return to MV Mahabaahu for a leisurely lunch and a relaxed afternoon. The evening features a talk on ‘Kamakhya, the Occult and Peacock Island’ and is followed by a traditional Assamese dinner. Yoga and breakfast are followed by the ship lifting anchor and heading towards an island that is occupied by a Muslim community who are involved in extensive farming. After visiting the village, return to the ship for lunch and sail towards Peacock Island, home to some golden langurs. Later, sail towards Pandu Port and anchor at a jetty. Get ready for the Farewell Dinner ‘AlvidaBhoj’ and enjoy a relaxed evening. Overnight onboard. Terms and conditions apply. All offers are subject to availability and operators booking conditions. Prices are based on cruise only & two passengers sharing the lead in grade stateroom unless otherwise stated. All discounts have been applied to fares displayed. ^Itinerary operates upstream, please call to confirm. *Savings have been applied to fares displayed and are valid on selected departures when booked by 31st May 2018. We charge a one-off small £20 booking fee. That’s it - nothing more and no add ons when you pay the balance. E&OE. ABTA P6710.